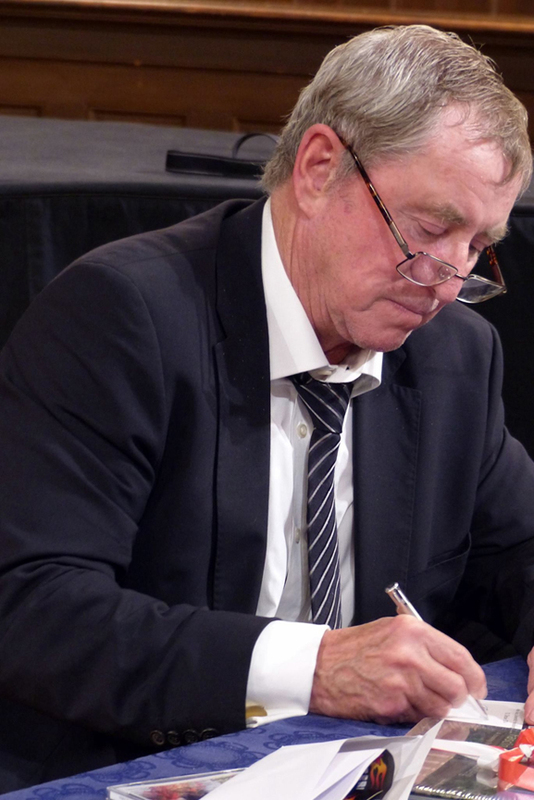 John Nettles was in Heildeberg, Germany on 10th October 2014 to talk about his book, Jewels & Jackboots. 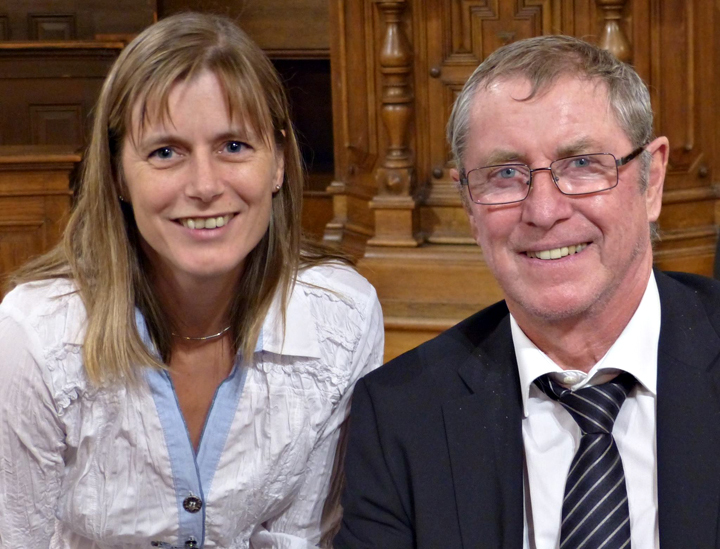 John Nettles will be playing the role of Cornwall in a play reading of Shakespeare's King Lear. 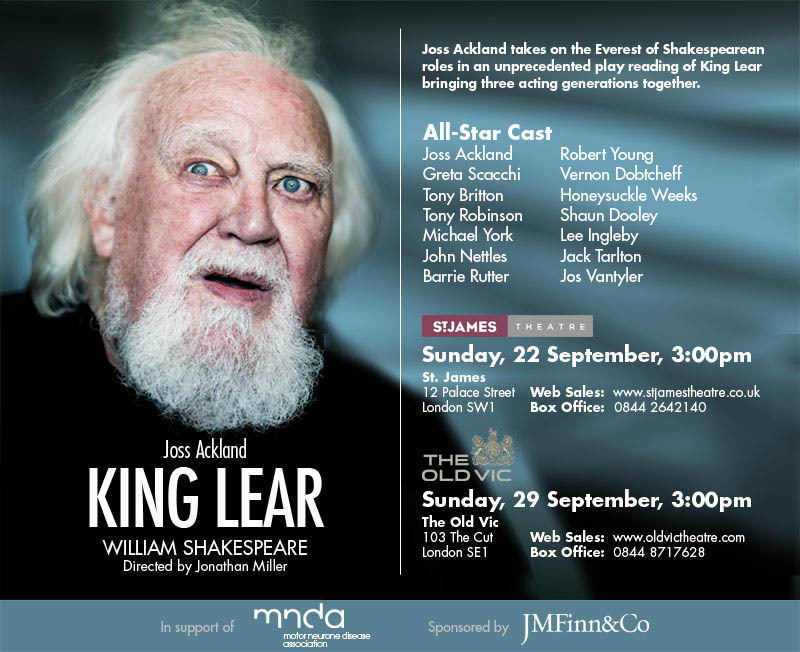 This is in support of the Motor Neurone Disease Association with Joss Ackland and an all star cast. Full details in the flier below. A new book, written by John, will be published on the 25th October. It is called Jewels and Jackboots, about the German occupation of the Channel Islands. You can hear John talking about the book on You Tube. 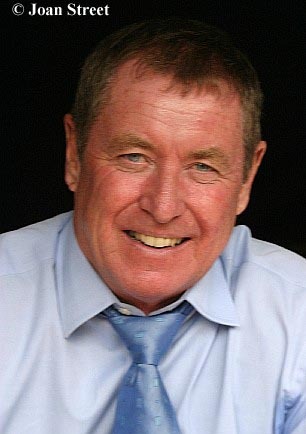 John Nettles was born in St. Austell, Cornwall on 11th October 1943. He studied philosophy and history at Southampton University where he also acted in drama society productions. It was there that he had a lucky break being spotted by an agent who arranged for him to work at the Royal Court theatre. Before 'Midsomer Murders' John Nettles was best known for his role as Sergeant Jim Bergerac, in the long-running T.V. series 'Bergerac'. Other T.V. appearances include 'A Family at War', 'Black Beauty', 'The Liver Birds', 'Dickens of London' and 'The Hound of the Baskervilles' . John has also been a long running player with the Royal Shakespeare Company, and has appeared in TV dramatisations of The Merchant of Venice and Romeo and Juliet. He has starred in several seasons of panto and narrated several major television series including Airport, Disaster, Fraud Squad, The Tourist Trap. A documentary about Sir John Betjeman led to John's involvement in a new series about the West Country, for Arts World. John currently lives in a beautiful converted barn near Eversham with his wife, Cathy and their two dogs, Alice and Toby. He still regularly flies to Jersey where 'Bergerac' was set, to see his daughter Emma who is assistant registrar for Jersey! John is a proud grandfather to Emma's son Nathan. Midsomer Murders - T.V. Series! Romeo and Juliet - T.V. Arnhem: The Story of an Escape - T.V. John appeared in the new series of the motoring magazine 'Pulling Power' on ITV1 (U.K.) on Tuesday, 5th August 2003. John revealed his passion for 'Rover' cars and some scenes from the current filming of the latest 'Midsomer Murder' series were shown. John opened the Annual Midsummer Fete at 'The Shakespeare Hospice' in Stratford on Saturday, 19th July 2003 at 1.00 p.m. The Fete was held in the Hospice grounds in Church Lane, Shottery. With thanks to Anna for this info.